Italy from East to West, from North to South. Countryside and seaside: relax in Tuscany and Amalfi Coast. Art and culture in the iconic cities of Rome, Florence and Venice. History in Pompeii and in the Vatican City. Experience Italy like an Italian: learn tips and tricks to cook an Italian meal, taste local delicacies in Chianti, sip wine while admiring Mt. Vesuvius. After this Tour Italy won't have any secrets for you! 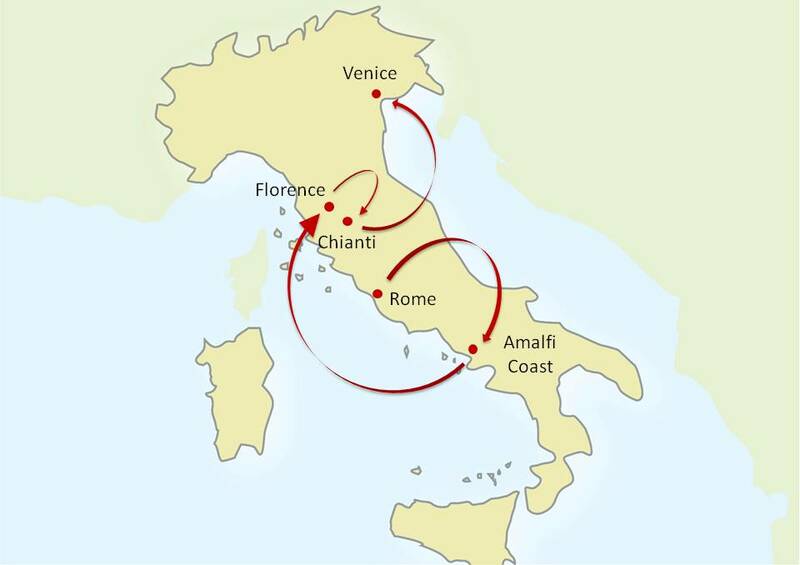 The Tour features Rome, Pompeii, Amalfi Coast, Capri, Florence, Tuscan countryside, the Chianti wine area and Venice. Make your wish at the Trevi Fountain in your Roman Holiday and get stunned with the breathtaking Sistine Chapel and the works of art of the greatest artists of the past in the city cradle of the Renaissance: Florence. Fall in love with the unique atmosphere of the Tuscan countryside and its picturesque villages on the hills. Learn the secrets of Italian cuisine during your exclusive Cooking Class in Tuscany and taste Italian delicacies on Mt. Vesuvius slopes. (Re)live the history of Pompeii and admire the breathtaking Faraglioni of Capri. Fall in love with the scents and the colors of the Amalfi Coast. Walk through the small calle in Venice and discover the romantique atmosphere of the city built on the water. 13 Nights accommodation in exclusive and fascinating 4 stars sup. Hotels with full buffet breakfasts: 3 Nights in Rome, 3 Nights in Positano, 2 Nights in Florence, 3 Nights in Chianti, 2 Nights in Venice. Welcome Honeymoon Package at your arrival in each hotel. Private sightseeing Tours with expert local English speaking Guides in Rome (Colosseum, Roman Forum, Vatican Museums and Sistine Chapel) – Pompeii – Florence (Accademia and Uffizi Gallery) – Venice (Basilica and Doge Palace); including tickets entrance fees to the sites visited avoiding waiting lines. Visit the cellars of a beautiful winery on Mt. Vesuvius slopes. Wine tastings and typical Lunch included. Winery visit and wine tasting in Chianti. Typical Lunch included. Exclusive Italian Cooking Class with an expert English speaking Chef in Chianti. Full Day Excursion to Capri Island by speed boat. High Speed Trains Rome – Naples – Florence – Venice: 1st class tickets and seats reservation. Private transfers by deluxe van with English speaking driver from/to the airport and from/to the train stations. The Tour is available as self drive or with private deluxe van with English speaking driver for transfers and excursions for the entire Tour. Private walking Tour to discover the capital of Italy: tickets for the Colosseum and the Imperial Fora included. Your private Guide will also take you to the Vatican Museums, St Peter’s Basilica and the Sistine Chapel in Vatican City to visit one of the most renowned museums of the world. Enjoy the beauties of Rome: make your wish at “Fontana di Trevi” and take an aperitivo in the lively streets of the eternal city. Winery visit, wine tasting and typical Lunch on the Vesuvio slopes. Visit the archeological site of Pompeii to discover how life was before the eruption of the Vesuvio in 79 AD. Reach Capri by taxi boat: the island in the gulf of Naples so loved by intellectuals, artists and writers, all captured by its magical beauty. Don’t miss the picturesque villages of the coast: Amalfi, Sorrento, Ravello and Positano. Enjoy the colors and scents of this incredible land. Private guided Tour of the city cradle of Renaissance: Florence. From Ponte Vecchio through Via Tornabuoni, admire the recently restored Santa Maria Novella and the gorgeous Santa Maria del Fiore Cathedral, with the Giotto bell tower. You will also visit the Accademia Gallery and the stunning works of art of the greatest artists from the Middle Ages to the Renaissance: Cimabue, Giotto, Botticelli, Leonardo, Michelangelo, Raphael, Titian and many others in the Uffizi Gallery. Explore the Tuscan countryside, starting from San Gimignano, with its hilltop setting and encircling walls forms a unique medieval skyline: the historic centre of the city is recognized as a UNESCO World Heritage Site. Typical Lunch in a family-run organic farm close, taste dishes of the tradition cooked with the farm products like the famous saffron. Wine pairings included. Memorable Tuscan Cooking Class in a lovely farm in Chianti with a private chef to learn the secrets of Italian and Tuscan cuisine in a very entertaining way. A full culinary experience including the right wine for your meal. The chef will teach you how to prepare a typical complete Italian menu. Dinner with the dishes you have cooked. 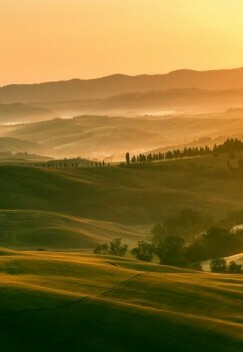 Enjoy the Tuscan sun and its unique landscape, characterized by gentle cultivated hills, occasionally broken by gullies and by picturesque towns and villages. A private local expert Guide will take you to the calle, the typical small streets of the fascinating town of Venice. You will have the opportunity the discover the secrets of the magic city built on the water. Visit St Mark’s Basilica with its fantastically ornate multi columned façade, spiritual intensity of its golden mosaics and sumptuously colored marble floor; the Doge’s Palace, seat of Venetian power with its powerful paintings and sculptures, the famous Bridge of Sighs and the “new” Prison.